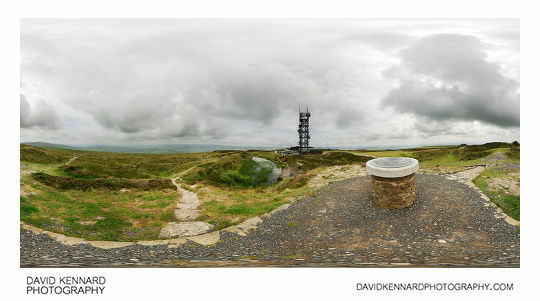 On the sixth (and last) day of our Shropshire holiday, back in July 2009, we visited Brown Clee Hill. 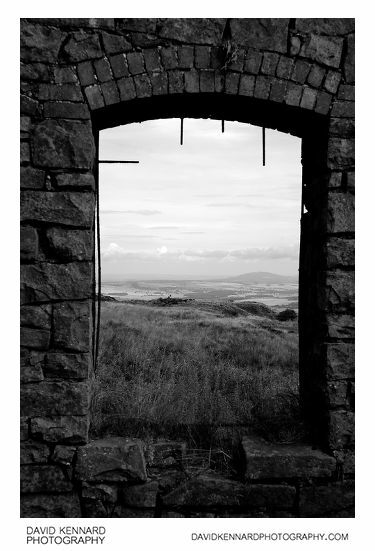 Brown Clee Hill is the highest hill in Shropshire, at 540m above sea level. 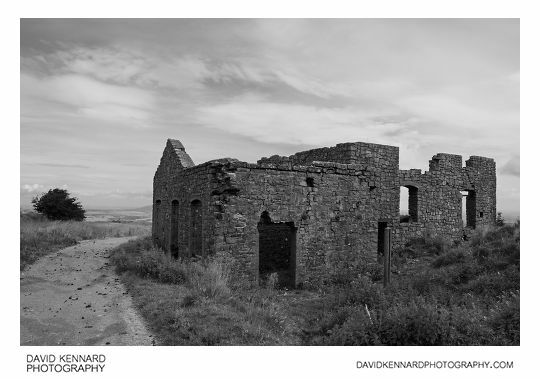 Brown Clee Hill used to be quarried for Dhustone (Dolerite), a hard volcanic rock used in building roads, kerbstones, and gateposts. 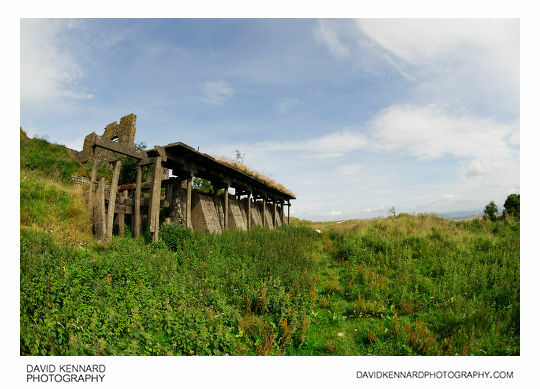 The quarries shut down in the 1930s and 40s, but there are still the abandoned buildings left. 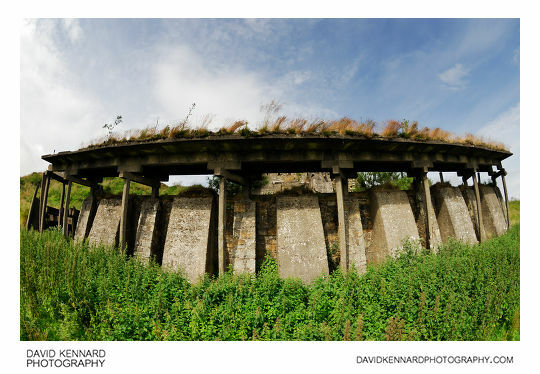 Below is the crushing house, where they used to crush the rock before sending it down the hill. I quite like this shot below, taken through a window from inside the Crushing House, though I think it would be better if I had composed the image more symmetrically, with the same amount of wall on either side of the window. Still, for a quick snapshot I think it's okay. We walked up the hill until we reached the highest point, Abdon Burf. I took a 360° pano from here. Unfortunately I didn't bring my tripod with me, so I had to do a handheld pano, which took lots of work to put together on the computer. I think the image might have been more interesting if I had taken the pano holding the camera over the toposcope (the plaque thing), but then it might also have been even harder to stitch. We then started off down the other side of the hill, where we came across a field with a family of horses in it that didn't seem bothered by our presence at all (they didn't come up to see us, neither did they run away). 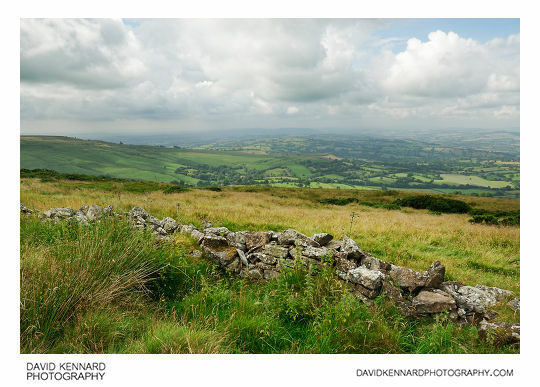 We then walked around the hill, there was a good view of the fields below, so I took a pano with my 50mm lens. My website doesn't allow for large panos at the moment, but you can see it on deviantArt. Unfortunately, the clouds appear very flat in my photos. I did try using Topaz Detail and Topaz Adjust on some of the images, which does bring out the clouds a bit, but not that great. Really I'd need to go back and take the shots again in better weather, but that's not an option. It started raining just as we got back to the car, then rained the rest of the day. We were due to leave our holiday cottage in Shropshire on Saturday, but the weather forecast for Friday was rain all day (and indeed it was), so we finished our holiday a day early and went back home on Friday morning. 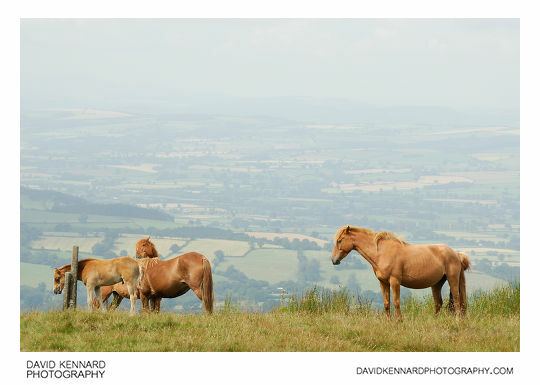 I did enjoy our time in Shropshire, it's just a shame the weather wasn't really conducive to photography while we were there (even though it was July).